Have you ever met the Problem with general Laser Range Finder, which can’t measure the distance between the flag? 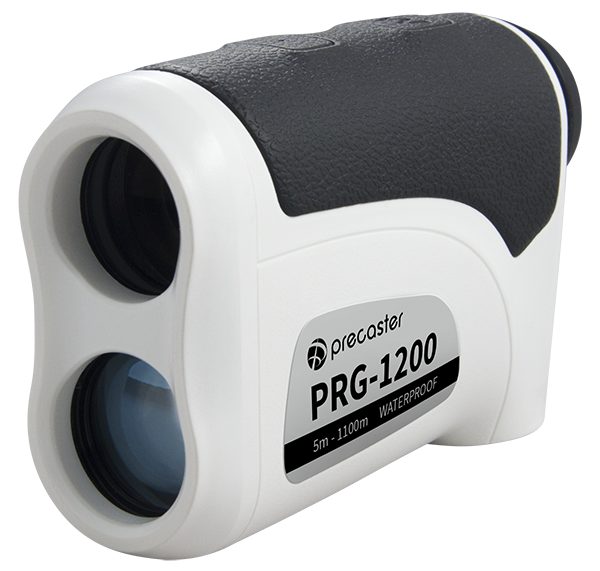 Try our PRG-1200, it can hunt the flag among the trees, lock-on wherever you walk, you can always get the correct distance to the flag and concentrate on every par you play. The PRG-1200 is especially for someone who loves Golf. The laser comes out with a accurate-tuned pulse to beat any atmosphere condition, it works with our super speedy measuring formula and a premium multi-layers coating to help you get the most range in 0.3 seconds for 1,100 meters (1200 yards). This looks complex but we do this every time when you hit the measure button and we are proud to do this with you. With our speedy measuring formula and accurate-tuned pulse, we guarantee you a fast measuring response time and a reliable result, over 500-meters the accuracy is ±0.3% and 100-meters to 500-meters is ±0.5%, PRF-1200 is designed for mid and long range and the one you can trust. When you hold the PRF-1200 in hands, you will be surprised by the size and the well-handheld feelings, it is only “160” gram with battery and size is 94.5cm x 65cm x 32cm with bold IP54 protection, bring the PRF-1200 to every duty you are heading to, be the new benchmark of measuring. PRF-1200 has only two buttons which are easy to get hands-on, you do not have to worry about which measuring mode fits your needs but think what you want to measure, the straight distance, the horizontal distance or the height of the object. Simple push the buttons, you will get the reliable measurements in no time.